William Martin assisted our client with the acquisition of this mixed use property and is providing Building Surveying and Employers Agent services in relation to the commercial refurbishment works. 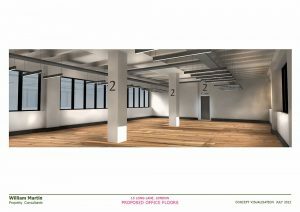 The existing aged interior layouts are being stripped out and modern open plan ‘warehouse’ style interiors created including remodelling of the toilets. The communal staircase is being modernised using mesh balustrading, new lighting, redecorations and flooring. The main receprtion is to be remodelled to create a bright and vibrant entrance.